Millennium Villages Project Briefing Paper No. 9: How is it being sustained? 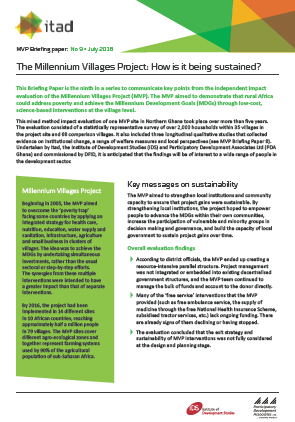 This Briefing Paper is the ninth in a series to communicate key points from the independent impact evaluation of the Millennium Villages Project (MVP). The MVP aimed to demonstrate that rural Africa could address poverty and achieve the Millennium Development Goals (MDGs) through low-cost, science-based interventions at the village level. This mixed method impact evaluation of one MVP site in Northern Ghana took place over more than five years. The evaluation consisted of a statistically representative survey of over 2,000 households within 35 villages in the project site and 68 comparison villages. It also included three longitudinal qualitative studies that collected evidence on institutional change, a range of welfare measures and local perspectives (see MVP Briefing Paper 8). Undertaken by Itad, the Institute of Development Studies (IDS) and Participatory Development Associates Ltd (PDA Ghana) and commissioned by DFID, it is anticipated that the findings will be of interest to a wide range of people in the development sector. The MVP aimed to strengthen local institutions and community capacity to ensure that project gains were sustainable. By strengthening local institutions, the project hoped to empower people to advance the MDGs within their own communities, increase the participation of vulnerable and minority groups in decision making and governance, and build the capacity of local government to sustain project gains over time. Read the full report, other briefing papers and annexes on our resources page.